Singapore/India, January 7, 2016 : Strontium Technology Pte Ltd, a leading player in the consumer flash storage, is set to introduce its highly anticipated foray into the world of wearable technology with an array of smart wearables for personal and home safety at CES 2016, Las Vegas, USA. 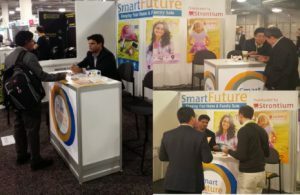 With this venture, Strontium has joined hands with SmartFuture as technology partner, to launch its range of offerings with a cutting edge technology. The company will showcase its first range of products at Eureka Park today which includes FindME, a lost and found tracker that will allow you to keep track of your valuables without any fear of losing it, Ivy, a smart fashion jewellery for women’s safety that will offer millions of women a more stylish and luxury safety gear that can be worn as a piece of jewellery and alert loved ones of their whereabouts when trouble arises and Hippo, a GPS enabled wearable device for kids will allow the parents to track their kids and ensure their safety. This wearable tracking device will give children the freedom to roam and parents the security of knowing where they are roaming. In addition to the safety, SmartFuture wearables designs will offer features centred on personalization, and discrete personal security. Designs look to bring a combination of style and tech to an entirely untapped audience of shoppers who are always looking out for safety without compromising their fashion statement. It will bring together a futuristic array of wearable and connected devices that enhance safety, lifestyle computing and communication with an emphasis on glamour. On this occasion, Strontium’s CEO and President, Mr Vivian Singh said, “Mobility remains the core of our business and with the telecom infrastructure getting stronger in India, connected portable devices are the future of mobility. We saw a huge market potential in this space and that inspire us to come up with our range of smart wearables focussed around family and home safety”. “We are extremely proud of our initial offering of smart wearables”, said SmartFuture’s CEO, Mr. Sumit Khemani. “We are happy to collaborate with Strontium to launch our range of smart wearables. Strontium is one of the leading brands when it comes to consumer flash storage and has good presence across geographies of interest to SmartFuture. Strontium will be an ideal partner to enter the market that will showcase a win-win situation for both and offer smart wearables to the Indian masses.”, he further added. SmartFuture Pte Ltd, is a Singapore based technology start-up providing R&D and mobile application development services in the space of security wearables. Founded in late 2015, by a team of experts from technology industry, it collaborates with leading manufacturers and service providers in the smart wearables domain to provide R&D services with cutting edge technology.